At Hoffman, your peace of mind is our first priority. Our trained security consultants help work with you to design a system that provides you unrestricted use of your home with a high degree of protection. Because no two homeowners share the same exact needs, we help you understand the products and services that will meet your needs, and then recommend a level of protection to accommodate both your concerns and your budget. We will design and install a home security system that addresses your needs and concerns for your home and family. Determine your true goals: Property protection? Personal protection? Will you use the home security system at all times, or mostly when you are away? Hoffman Electronic System's Construction Services Division Helps Builders Gain a Competitive Advantage. Hoffman Electronic Systems is a leader in new construction security systems and advanced wiring services. 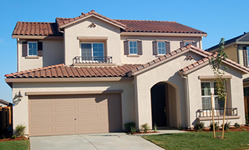 We began marketing security systems as an option for new homebuyers in the early 1980s. Today, we can help you deliver the right combination of products and profitability. Hoffman's local monitoring system offers you a lot more than just security. Of course, we can monitor your doors and windows whether you are home or away; but our system can also be used to detect smoke, heat, and carbon monoxide. It's Home Security, plus a whole lot more.